Past Corporate Projects - Jacaranda, Inc.
Jacaranda’s real wood veneer wallcoverings grace the walls of some of the most recognizable corporate buildings in the country. Our revolutionary SanFoot, TransTec, FineTec and other veneer products offer strength, beauty and versatility. 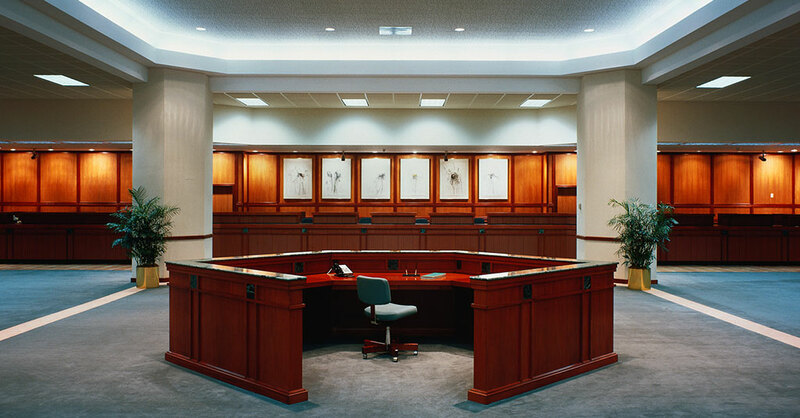 When used on columns, ceilings, reception counters, walls, millwork and doors, our architectural grade wood veneer offers an unparalleled turnkey design solution for corporations, businesses, retail establishments, the hospitality industry and more. No matter what message you’re trying to send with your company’s look, we can help you strengthen and perfect it. Our elite chemical scientists create custom stains, finishes and dyes, and we can further fine-tune the results to ensure you get the exact look you want. We even offer exciting options such as TransTec translucent veneer to bring a warm glow to any environment and FineTec, which makes exotic and rare figures more accessible. We are proud to offer more than 100 species and cuts from which to choose for your commercial wallcoverings. We have everything from ash and bamboo to rosewood and zebrawood. We carefully select trees from old growth forests, which helps keep the environment healthier and provides more space for younger, robust trees. With responsibly grown plantation trees, Jacaranda can ensure a sustainable supply for future generations. Finally, recon wood veneer can be used, enabling you to enjoy rare or exotic woods without a negative environmental impact. By altering and dyeing the wood of species that are available in abundance, we can create veneers that closely mimic exotic species as well as enhanced colors and textures that cannot be found elsewhere. Dan Whittelsey, Sr., the founder of Jacaranda, began importing stick wood logs, or dimensioned lumber, from Central America in the early 1970s. Hokusan, a Japanese veneer company, expressed interest, and in return, they sent their own exotic veneer and fancy face plywoods back to the U.S. By the mid-70s, Mr. Whittelsey and Hokusan had united to create Jacaranda. Today, Jacaranda is renowned for its architectural grade wood veneer. Our patented process enables us to get 300 percent more veneer from each log we use. Our commitment to the environment doesn’t end there: SanFoot and our other veneers are all Class A Fire Rated, no added Formaldehyde, and certified by the Forest Stewardship Council and the U.S. Green Building Council. Contact us to learn more.